Sir John Charles Frederic Sigismund Day [d. 1908], Falkland Lodge, Newbury, Berkshire, by 1891; (his estate sale, Christie, Manson & Woods, Ltd., London, 13 May 1909, no. 11); purchased by (Arnold & Tripp, Paris). (E.J. van Wisselingh and Co., Amsterdam); sold 1909 to (M. Knoedler & Co., London, New York, and Paris); sold 1909 to R. Horace Gallatin [1871-1948], New York; bequest 1949 to NGA. 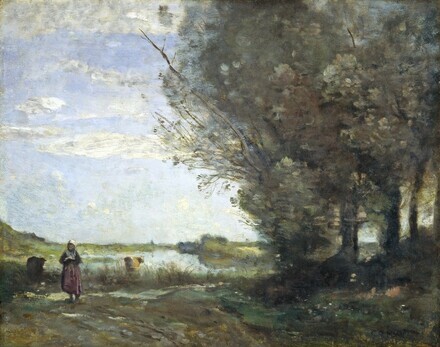 Alfred Robaut, L'oeuvre de Corot, Paris, 1905: III:364, no. 2327 (1865-1872). Annotated catalogue of Day sale in M. Knoedler library. According to Getty Provenance Index, quoting M. Knoedler records. Loan for display with permanent collection, Tampa Bay Art Center, University of Tampa, Florida, 1967-1969. Loan for display with permanent collection, Museum of Fine Arts, St. Petersburg, Florida, 1969. Robaut, Alfred, and Etienne Moreau-Nélaton. L'Oeuvre de Corot. Catalogue raisonné et illustré. 5 vols. Paris, 1905: 3:no. 2327, as La paysanne aux deux vaches. Summary Catalogue of European Paintings and Sculpture. National Gallery of Art, Washington, 1965: 30. European Paintings and Sculpture, Illustrations. National Gallery of Art, Washington, 1968: 24, repro. European Paintings: An Illustrated Summary Catalogue. National Gallery of Art, Washington, 1975: 76, repro. Walker, John. National Gallery of Art, Washington. New York, 1975: 436, no. 634, color repro. Walker, John. National Gallery of Art, Washington. Rev. ed. New York, 1984: 432, no. 622, color repro. European Paintings: An Illustrated Catalogue. National Gallery of Art, Washington, 1985: 95, repro. Eitner, Lorenz. French Paintings of the Nineteenth Century, Part I: Before Impressionism. The Collections of the National Gallery of Art Systematic Catalogue. Washington, D.C., 2000: 78-81, repro.